Secretary of State Mike Pompeo, right, meets with NATO Secretary General Jens Stoltenberg at the State Department in Washington, Sept. 13, 2018. NATO Secretary General Jens Stoltenberg says he has no intention of backing down in the face of a "resurgent" Russia, insisting the Western alliance will hold a firm but fair line with Moscow while continuing to accept former Soviet states. Stoltenberg made the comments Friday, following meetings at the White House with National Security Adviser John Bolton and at the State Department with Secretary of State Mike Pompeo. "For us there is no contradiction between being firm, strong in our approach to Russia, as we are, and at the same time seeking dialogue," he told an audience at The Heritage Foundation, a conservative think-tank in Washington. Tensions between Russia and the West have been rising steadily since Russian forces rolled into Georgia over a decade ago, and reached new heights with Moscow's invasion of Ukraine and annexation of Crimea in 2014. While emphasizing that NATO is not seeking confrontation, Stoltenberg put much of the blame on a Moscow "willing to use military force against neighbors." "What we have seen is a more resurgent Russia, a Russia which has invested in many different types of capabilities, also in intelligence," he said. "That is the reason why NATO allies have started to invest more [in defense] for the first time since the end of the Cold War." Stoltenberg's approach contrasts with that of U.S. President Donald Trump, who has repeatedly sought to emphasize his ability to get along with Russian President Vladimir Putin and his desire to have a better relationship going forward. FILE - U.S. President Donald Trump and Russian President Vladimir Putin shake hands as they hold a joint news conference after their meeting in Helsinki, Finland, July 16, 2018. 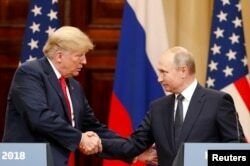 Most notably, during his July 16 Summit with Putin in Helsinki, Trump said he believed Putin's claims that Russia did not try to meddle in the 2016 U.S. presidential election, a claim that contradicted the findings of U.S. intelligence officials and which he subsequently tried to walk back. Others in the White House have taken a harder line against Moscow. National Security Adviser Bolton warned Russia last month the U.S. is "prepared to take necessary steps" to prevent the Kremlin from interfering in the upcoming midterm elections in November. But the NATO secretary general said Friday he sees few signs Russia is scaling back its activities. "We have seen they are using media and social media, disinformation to try to influence political processes in different European, NATO-allied countries," Stoltenberg said, echoing concerns by U.S. Defense Secretary James Mattis, who is traveling to the Macedonian capital Skopje on Sunday, that some of those efforts are targeting the upcoming referendum there. A vote on September 30 to officially change the country's name to the Republic of North Macedonia would help pave the way for NATO membership, which Moscow strongly opposes. Stoltenberg also said NATO would continue to support efforts by both Georgia and Ukraine to become NATO members, moves that Russia has long opposed. FILE - US soldiers watch as Georgian military vehicles take part in NATO-led Noble Partner 2017 multinational military exercises at the military base of Vaziani, outside Tbilisi, Georgia, Aug. 9, 2017. "Georgia will become a member of NATO," he said. He further warned the alliance has responded to an increased Russian presence in the Arctic by strengthening its overall maritime posture and with member states like Britain and Norway increasing surveillance in the region. "I still believe it is important to try to keep tensions down in the high north," he said, adding it was NATO's goal to find ways to work with Russia on environmental issues. Stoltenberg has been in the U.S. meeting with key U.S. officials like Bolton, Pompeo and Mattis in an effort to solidify support for the alliance. President Trump has consistently criticized NATO members for not spending enough on defense and for making the United States pay an unfair share of the costs. Stoltenberg on Friday pushed for continued U.S. support for NATO, calling the transatlantic alliance "a bond that guarantees our prosperity, our security, and our freedom." He also said he is in favor of separate, European Union-led efforts to bolster Europe's defense industry. "We need more European capabilities. We need more European cooperation on defense," he said, referring to the EU Permanent Structured Cooperation, or PESCO, initiative. "This is not about creating an alternative to NATO. This is about strengthening the European pillar within NATO," he said. The Trump administration, in April, rolled out an initiative aimed at expanding U.S. arms sales worldwide, with the president himself encouraging allies to buy more U.S.-made weapons systems.